Norton Security with Backup (formerly Norton 360) is an exclusive mix of technologies that delivers comprehensive antivirus and Internet protection. Insight identifies which files and applications are safe and which are dangerous, using the combined feedback of more than 175 million Norton users. SONAR Behavioral Protection detects signs that a file is dangerous to proactively protect you from never-before-seen threats. Spam Blocking keeps your mailbox free of unwanted, dangerous, and fraudulent emails. Live 24/7 Threat Monitoring is backed by a network of Norton users who serve as your own personal Neighborhood Watch group. Warns you about social media scams and threats to your personal information. Scam Insight reviews a website's reputation and lets you know if it's safe to enter your personal information. Anti-Phishing Technology blocks fraudulent "phishing" sites set up to steal your personal information. Identity Safe remembers, secures, and automatically enters your usernames and passwords for you, so they can't be lost or stolen. Parental Control feature helps you protect your kids from online dangers by giving you direct access to Norton Online Family. Safe Web tells you if a website is unsafe before you visit it and it's too late. Safe Web for Facebook scans your Facebook wall and news feed for URLs containing security threats such as phishing sites, malicious downloads, and links to unsafe external sites. Intelligent 2-way Firewall prevents strangers from accessing your home network by blocking incoming traffic determined to be unsafe. How I get around the toolbar. When IE asks me to enable them, I say no to the toolbar and yes to the vulnerability one. So I think that gives me protection without the toolbar. If Anonymous was able to get the source code, how secure was it in the first place? As I see it the future of AV is the likes of latest Webroot Smart Security, with an install size of 600k & a memory footprint of around 5 meg it is brilliant. Expect more of this from other AV suppliers over the coming months. Before you knock it - Try it - I too was cynical. All signature based AV - Anti Malware are on the way out. This is far beyond junk. It completely takes over your machine and makes you, the users, a slave to the machine. Still junk. And yes I tested! Has always sucked!!! Complete bloatware still! I have not installed the beta version, but I have had Norton 360 version 5 on my computer. I am running Windows 7 64 bit, and while I find this Norton to be much improved, it did cause a problem on my computer. I was unable to turn off the part that allows me to keep some setting for web sites (bank and credit card). I am going to tr working with Norton to see if it is correctable. This is only on my machine from what I understand. I am rating it as a 3 nly because of that. I am one that used to not like Norton at all, but this version is much, much improved. My suggestion. Give it an honest try, if it gives you any problems, get in touch with the Norton support. They really seem to want to work things out now. Considering the fact that you refer to Norton as "Nortons" like every other ignorant 80 year old out there, I have a hard time finding anything useful in your review. Unlike CyberDoc, I legitimately DO fix PCs for a living and recommend Norton 360 or Kaspersky IS to every one of my customers. N360 for the neanderthals, and KIS for those who do not dislike Windows 7 because it looks different than "the XP", as the neanderthals put it. N360 has a light footprint and installs quickly and easily. My colleagues and I install N360 on about 20 PCs a week, and not once has their been a problem. I use it myself on my netbook because KIS has a larger footprint therefore is more likely to slow it down further. On my main non-UNIX machines, I use Kaspersky IS. 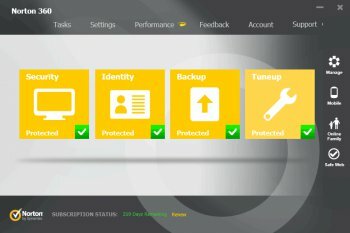 Norton 360 is an excellent product for those who are not "computer savvy". If you overcame you prejudges regarding the bloated crapware that Norton used to turn out actually & move to 2011 from 1987 & evaluated Norton AV products TODAY you would be amazed. I too wouldn't have had a Norton product near any of my machines but I moved on & found 360 & Internet Security are the by far the best AV’s around, bar none. Oh & my three PC's all have different operating systems on XP, Vista, on on this new PC 7, so I know it fine on all MS platforms. This is from a diehard ex Eset user of many, many years. To be frank 'ZenWarrior’ I don't believe a word of your post, from two machines – unmitigated total absolute rubbish & lies (or is that ‘trash’ to you?). CyberDoc999 I assume you haven't installed the product as you won't have Norton near your PC's therefore how did you review 360? Therefore I conclude your review is invalid as its based on an old opinion not actual testing. I installed Norton AV on all 3 of my machines a few weeks ago with not one problem, it is fit & forget brilliant software. it doesn't even slow my old trusty ancient DELL 620 lappy down.